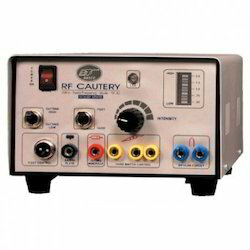 Prominent & Leading Manufacturer from New Delhi, we offer rf cautery. Radio Surgery RF Cautery involves the passage of high frequency radio waves (2mhz-Megahertz) through soft tissue to cut, coagulate, or remove the tissue. Soft tissue resistance to these radio waves causes the cellular water in the soft tissue to heat, which produces steam, an results in cellular molecular dissolution of individual tissue cells. Radio surgery in general practise has many advantages over conventional surgical techniques particularly dermatological, plastic and eye lid surgery,ENT,Dental,quicker operating time;rapid healing,less tissue damage and less post operative discomfort have been observed and its wider use in hospital practise is recommended. Fulguration 100 Watts on 1000 ohm. Size: 8 1/2" X 7 1/2" X 4"